Gennady Bogolyubov, Victor Pinchuk, and Igor Kolomoisky (lead image, left to right), the three Ukrainian oligarchs who settled their business differences last Friday, were afraid to risk their bank credit lines if a High Court trial, scheduled to commence this week, went ahead. Sources close to the three men say it proved easier for them to agree on a secret money deal between themselves than to trust a British judge to assess their deal-making record in public. “MAD, Mutually Assured Destruction – that was the outcome if the three oligarchs went into court against each other”, says one source. The sources confirm a report circulating in Kiev and another in Davos that Kolomoisky and Bogolyubov have agreed to pay Pinchuk $500 million in instalments over several years. The money may come from assets jointly owned by Kolomoisky and Bogolyubov; these include Privat Bank, the Nikopol ferroalloy refinery, or the Krivoy Rog iron-ore combine, which has been the focus of the most recent dispute. Pinchuk’s public relations agent in London, William Clutterbuck, released the settlement announcement in a brief email. Lawyers and associates of Kolomoisky and Bogolyubov refuse to speak. Pinchuk opened the UK High Court proceeding in May 2013 with a claim for $2 billion in compensation for his stake in the Krivorozhskiy Zhelezorudnyy Kombinat (KZhRK, Krivoy Rog iron-ore plant). In his court papers Pinchuk claimed he had paid $143 million for shares her didn’t receive. For details, read this. Based in the Dniepropetrovsk region of eastern Ukraine, the iron-ore plant reported net income for 2014 of 1.3 billion hryvnia ($63 million). 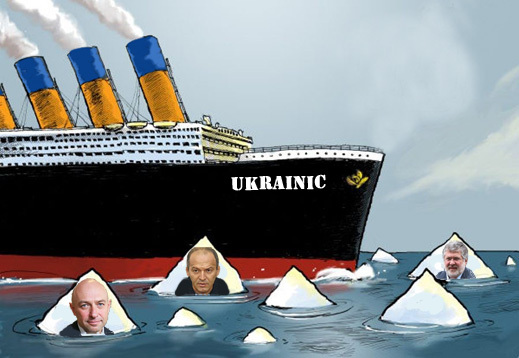 Since then, as global demand for iron-ore has dwindled and export prices have dived, along with trading conditions in the Ukraine, production at KZhRK reportedly dropped by 2% in 2015, and sales revenue by more, discounting the asset value which Pinchuk has been claiming in London. Kolomoisky, who lives in Geneva and works between Ukraine and Switzerland, and Bogolyubov who lives in London and directs his businesses from there, argued in their court papers that Pinchuk and his father-in law, then-Ukrainian president Leonid Kuchma, corruptly manipulated the privatization of KZhRK for their personal gain, and attempted to cheat them with terms of agreement they hadn’t signed. According to pleadings filed separately in court, the evidence was lacking for Pinchuk’s version of the KZhRK deal. The duo said there had been meetings in various places and at various times, some of which Bogolyubov didn’t attend at all. Pinchuk’s version of the oral record was disputed by witnesses who include a well-known rabbi. According to Kolomoisky, such documents as were negotiated between the duo and Pinchuk concerned other assets engaged in the production of manganese and ferroalloys, not iron-ore. For more, read this. Pinchuk has a home and headquarters for his EastOne asset holding in London. 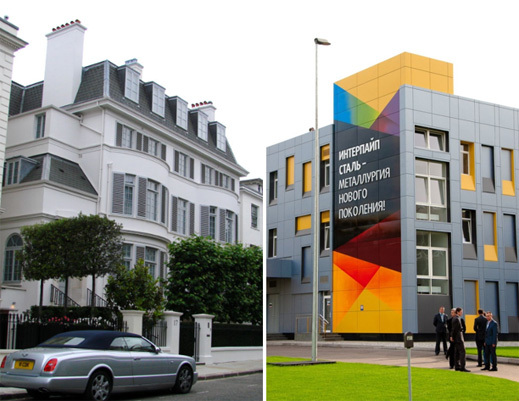 Left: the Pinchuk residence at Upper Phillimore Gardens, Kensington. Right: Interpipe headquarters at Dniepropetrovsk. Pinchuk’s steel and pipemaking company in Dniepropetrovsk, Interpipe, has been under pressure from bank and bond creditors since it defaulted in November 2013 on $1 billion of debt, including $200 million worth of bonds. The $500 million he has won from Kolomoisky and Bogolyubov may now be shared with the banks and bondholders, although lawyers involved suspect the settlement deal he has struck may shield him from the legal obligation to do so. Pinchuk’s Ukrainian bank, Credit Dnepr, has also been under pressure from the International Monetary Fund (IMF) and the National Bank of Ukraine to obtain fresh cash liquidity from Pinchuk as its control shareholder to meet new solvency targets. Ukrainian and Russian media reports, echoing Reuters, the Wall Street Journal, and Fox News, claim that Pinchuk has been under pressure not to allow the High Court case to go ahead because of the evidence that might be forced into the open. Pinchuk is reported in the US to be under investigation by the Federal Bureau of Investigation (FBI) for $13 million in donations he has made to the Clinton Foundation. The money, according to Russian investigations, came in part from theft and fraud involving $210 million at the Rossiya insurance company, which Pinchuk owned in Moscow and which he looted, according to Russian prosecutors and Moscow insurance regulators. US media reports claim the FBI is investigating the relationship between Pinchuk, Hillary Clinton, her daughter Chelsea, her son-in-law, and the Clinton Foundation to determine “whether donors benefited from their contacts inside the administration.” Details of Pinchuk’s connexions to Clinton and his business benefits have been reluctantly disclosed by US reporters. For more on Pinchuk’s lobbying of US officials to obtain steel trade concessions, read this. An email of June 12, 2012, to Hillary Clinton from Melanne Verveer, a Ukrainian-born protégé of Clinton’s, says: “I had breakfast with Pinchuk. He will see you at the Brookings lunch.” Pinchuk was paying a US lobbyist $40,000 per month to arrange these meetings; he was also paying $200,000 per annum to Brookings for a seat on its council, and to employ an ex-US ambassador to Ukraine, Steven Pifer. For more details, read on. Left: Chelsea Clinton with Pinchuk, January24, 2012, photographed at the Pinchuk Foundation, Kiev. Right: Verveer with Ukrainian Ambassador to the US, Valery Chaliy, October 14, 2015. For more on Pinchuk’s lobbying of Verveer, read this. Kolomoisky has been under investigation in the US in several civil court cases involving real estate, steelmills, and other alleged business misconduct; see this. His role in diverting IMF funding for PrivatBank is also under international scrutiny. Bogolyubov has avoided adverse attention from the Ukrainian media since the replacement of the Yanukovich administration in February of 2014. 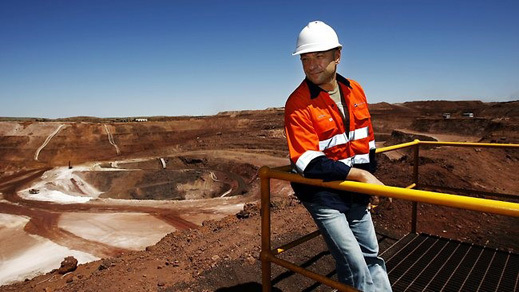 In May 2014, his Australian and African mining company, Consolidated Minerals, successfully refinanced $400 million in bonds held by US investors, and due for repayment in 2016; the new obligations do not fall due for repayment until 2020. Most of Bogolyubov’s metals and mining business is now outside the Ukraine and outside the US. Much of Bogolyubov’s real estate assets is concentrated in London. He avoided further disclosure of those when he settled another High Court lawsuit, alleging he had failed to pay commission and profit share on several of his deals. Three sources familiar with last week’s settlement negotiations say they succeeded because each of the parties wanted to avoid testifying under cross-examination, and “the risk of Boris Berezovsky’s fate.” For more details on the Berezovsky case and the final judgement, see this. Left: Berezovsky, Abramovich; right: Bogolyubov, Kolomoisky. Deripaska agreed to settle Chernoy’s High Court claim in September 2012, after the trial had started but before it reached cross-examination or judgement. The confidential settlement obtained by Chernoy was $500 million in instalments over 5 years, , part paid by Deripaska, and part by Iskander Makhmudov. “If Pinchuk gets $500 million from Kolomoisky and Bogolyubov”, calculates a UK High Court specialist, “it will match the record for Russian and Ukrainian litigation in London.” From his defeat of Berezovsky, Abramovich won only his costs of £35 million.